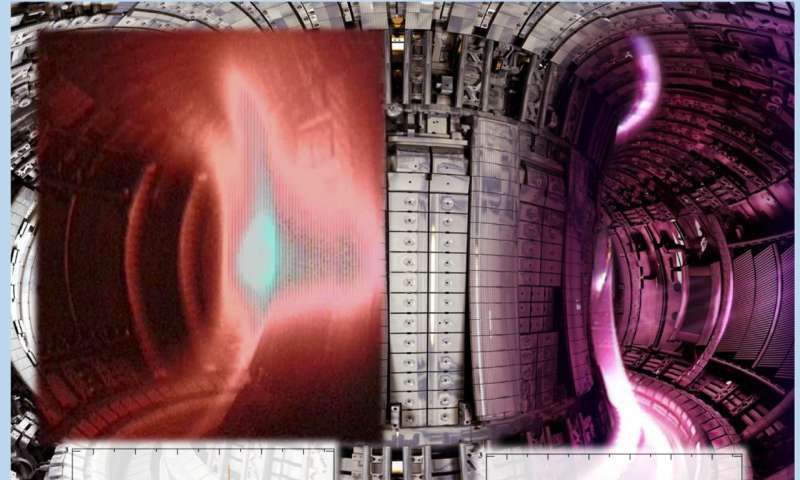 Plasma disruption in experiment on JET, left, and disruption-free experiment on JET, right. Training the FRNN neural network to predict disruptions calls for assigning weights to the data flow along the connections between nodes. Data from new experiments is then put through the network, which predicts "disruption" or "non-disruption." The ultimate goal is at least 95 percent correct predictions of disruption events. Credit: Eliot Feibush. Today, researchers at the U.S. Department of Energy's (DOE) Princeton Plasma Physics Laboratory (PPPL) and Princeton University are employing artificial intelligence to improve predictive capability. Researchers led by William Tang, a PPPL physicist and a lecturer with the rank and title of professor at Princeton University, are developing the code for predictions for ITER, the international experiment under construction in France to demonstrate the practicality of fusion energy. The new predictive software, called the Fusion Recurrent Neural Network (FRNN) code, is a form of "deep learning"—a newer and more powerful version of modern machine learning software, an application of artificial intelligence. "Deep learning represents an exciting new avenue toward the prediction of disruptions," Tang said. "This capability can now handle multi-dimensional data." Chief architect of FRNN is Julian Kates-Harbeck, a graduate student at Harvard University and a DOE-Office of Science Computational Science Graduate Fellow. Drawing upon expertise gained while earning a master's degree in computer science at Stanford University, he has led the building of the FRNN software. Using this approach, the team has demonstrated the ability to predict disruptive events more accurately than previous methods have done. By drawing from the huge data base at the Joint European Torus (JET) facility located in the United Kingdom—the largest and most powerful tokamak in operation—the researchers have significantly improved upon predictions of disruptions and reduced the number of false positive alarms. EUROfusion, the European Consortium for the Development of Fusion Energy, manages JET research. The team now aims to reach the challenging goals that ITER will require. These include producing 95 percent correct predictions when disruptions occur, while providing fewer than 3 percent false alarms when there are no disruptions. "On the test data sets examined, the FRNN has improved the curve for predicting true positives while reducing false positives," said Eliot Feibush, a computational scientist at PPPL, referring to what is called the "Receiver Operating Characteristic" curve that is commonly used to measure machine learning accuracy. "We are working on bringing in more training data to do even better." The process is highly demanding. "Training deep neural networks is a computationally intensive task that requires engagement of high-performance computing hardware," said Alexey Svyatkovskiy, a Princeton University big data researcher. "That is why a large part of what we do is developing and distributing new algorithms across many processors to achieve highly efficient parallel computing. Such computing will handle the increasing size of problems drawn from the disruption-relevant data base from JET and other tokamaks." The deep learning code runs on graphic processing units (GPUs) that can compute thousands of copies of a program at once, far more than older central processing units (CPUs). Tests performed on modern GPU clusters, and on world-class machines such as Titan, currently the fastest and most powerful U.S. supercomputer at the Oak Ridge Leadership Computing Facility, a DOE Office of Science User Facility at Oak Ridge National Laboratory, have demonstrated excellent linear scaling. Such scaling reduces the computational run time in direct proportion to the number of GPUs used—a major requirement for efficient parallel processing. Princeton University's Tiger cluster of modern GPUs was the first to conduct deep learning tests, using FRNN to demonstrate the improved ability to predict fusion disruptions. The code has since run on Titan and other leading supercomputing GPU clusters in the United States, Europe and Asia, and have continued to show excellent scaling with the number of GPUs engaged.